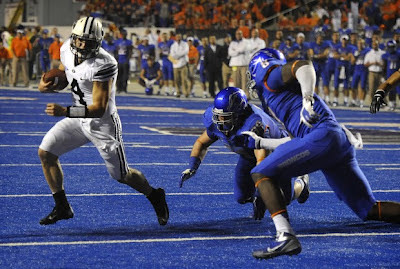 I've decided I need to get my feelings down in writing about last night's BYU / Boise State game before my head explodes. I don't think I have ever been so angry, confused, disillusioned, and shocked after a football game in my life. I had the hardest time falling asleep last night because I was so tempted to slam my fist through the wall. Yep, it was that bad. BYU didn't deserve to be in that game, honestly. The offense played horribly as a whole, but mostly Riley Nelson. Something still isn't right there. The coaches are saying he's in a lot of pain from hurting his back a few games ago, but I think it's got to be more than that. Trust me-- I know all too well how debilitating back pain can be. I had back surgery last summer and I'm still in pain on a daily basis... but that's no excuse for committing 5 turnovers, I'm sorry. I still think he has some kind of head injury from the Utah game-- seriously. Has he been examined? There is something wrong, and they need to figure out what it is or they're going to lose out the rest of the reason. If nothing else, I think Riley has lost his right to be trusted by the coaching staff. In an interview with Brandon Doman last night, he said they wanted to put Taysom Hill in earlier in the game, but Riley insisted he was fine and wanted one more drive to prove it. The coaches trust him, so they let him do it. But he threw an interception on that drive. Trust REVOKED. I'm not trying to criticize Riley's playing ability (even though it seems like just about everyone is right now) and we certainly don't need all the talk that seems to be surfacing wishing Jake Heaps was still here (NOTHING could be THAT bad! ), but I do think Riley needs to recognize his limits and turn decisions of who should be playing over completely to the coaches. If he's not playing well enough on a particular day, he needs to be pulled. BEFORE he commits 5 turnovers. While I am sorely disappointed in the offense's play, the main source of my anger comes from the decision to go for a 2-point conversion at the end after Taysom FINALLY scored a TD. I was FUMING mad, even before they missed it. The decision that Bronco made to go for it was nothing short of idiotic. I think there needs to be an extensive psychoanalysis performed on his brain. WHAT WAS HE THINKING?!? Yes, 5 turnovers from Riley are unacceptable... but when your defense is so stellar that they give you a chance to turn it around and send the game into overtime and you don't take the almost surefire way out, that is unacceptable times a million. Not only was it stupid, but it was completely disrespectful to Taysom, Cody, and the rest of the offense who fought so hard to get that ball in the endzone. It was also disrespectful to the defensive players, who were the reason they even had a chance in the first place. It threw all their hard work down the drain in about 2 seconds. It was one thing to take to put in a freshman quarterback for the rest of the night, giving him the ball at his own 1-yard line in the third quarter. Bold move. Maybe even necessary. BYU fans must be red in the face. With anger. BYU coaches should be red in the face. With embarrassment. By choosing to go for 2, Bronco essentially slapped his players in the face and handed the game to Boise State on a silver platter (and yes, it was Bronco's decision-- Brandon Doman confirmed that in his post-game interview). Even if they had made the 2 point conversion and won the game in overtime, I would still think it was the dumbest decision he has ever made (and hopefully will ever make). It was so uncharacteristic of him, too-- he is not one to take risks at all, especially dumb ones when the entire game is on the line. I just can't believe it. It's one thing to lose the game because your quarterback is having a terrible night (and the rest of the offense is nothing to brag about, either), but to have a really good chance to tie the game and NOT take it because of a stupid, stupid, STUPID decision from the head coach is completely another thing. Thus, I put the blame for this loss completely on Bronco's shoulders. Riley can blame his mistakes on injuries and his head not being in the game, but there are NO excuses for what Bronco did. 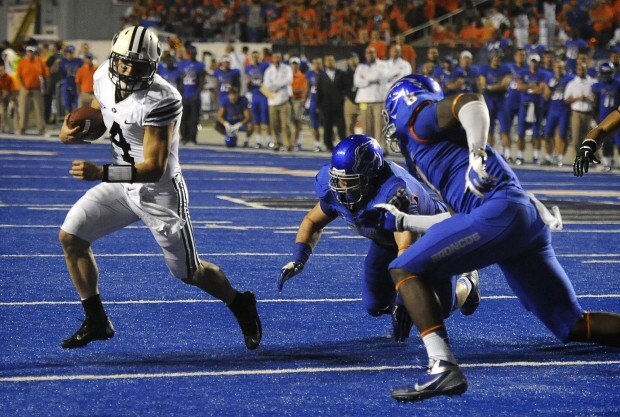 That being said, I've got to give MAJOR props to the defense, especially Kyle Van Noy and Ziggy Ansah. That was the most impressive defensive effort I have ever seen in my life. They allowed ZERO points from Boise State on the smurf turf. That is a HUGE accomplishment, and they have absolutely nothing to be ashamed of. Way to go, boys. Taysom Hill also impressed me. He's got a lot of things he still needs to improve on, but he drove that ball 95 yards when it mattered most against insurmountable odds. It's not his fault his coach threw it all away in the end. My worst nightmares are coming true... Unless Riley can get healthy and get his head back on his shoulders FAST, the whole season might come tumbling down (in fact, I think it already has). They'll be lucky if they become bowl elligible at this rate. I don't know how much more of this I can handle. Is it basketball season yet?? ?